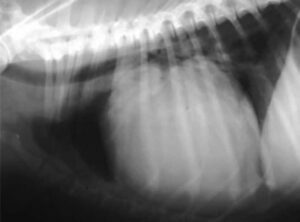 Pericardial effusion is considered a cardiac emergency situation that is most commonly seen in canine patients. It is very important, especially for veterinary technicians in emergency care facilities, to be able to recognize the signs of pericardial effusion and quickly respond. Protects the heart from neoplasia and infections. FIGURE 1. Diagram depicting relationship between the pericardium and heart. Excessive fluid in the pericardial space is called pericardial effusion. 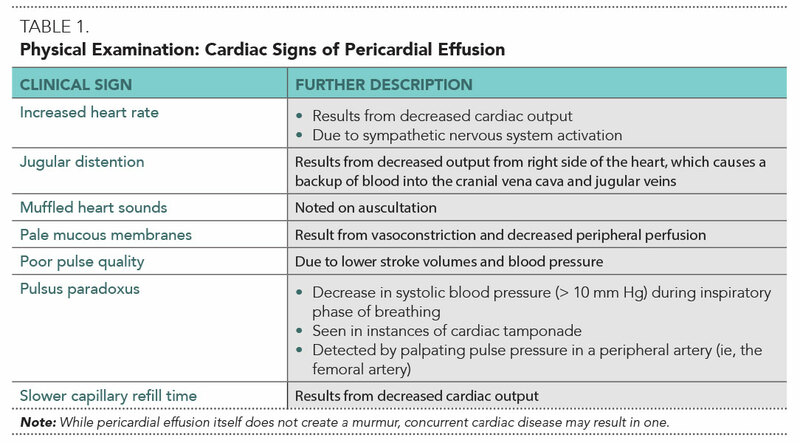 When effusion accumulates slowly, the pericardium can enlarge to accommodate this increase in volume and, if intrapericardial pressure is low, clinical signs may not be present and cardiac function remains relatively normal. The body tries to compensate by increasing heart rate and peripheral vascular resistance to help maintain normal blood pressure. As intrapericardial pressure continues to rise, it causes collapse of the right side of the heart, preventing cardiac output into the pulmonary artery. Since blood is no longer leaving the right side of the heart, there is no venous return to the left atrium and ventricle,2 eventually resulting in cardiogenic shock manifested by lethargy, hypotension, poor pulse quality, and tachycardia. Peritoneopericardial diaphragmatic hernia: A condition in which the septum transversum fuses with the pleuroperitoneal folds, creating an incomplete separation of the abdominal and thoracic cavities and usually resulting in a small amount of fluid accumulation. However, gastrointestinal signs are more commonly noted due to the presence of abdominal organs within the pericardial cavity. Pericardial cysts: Another congenital cause of pericardial effusion, but they are much rarer and often asymptomatic. 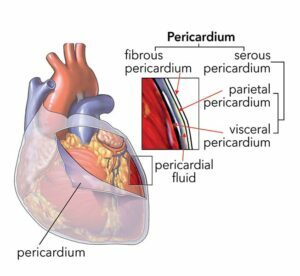 An acquired cause of pericardial effusion is pericarditis, which stems from neoplastic, immune, inflammatory, and, occasionally, infectious disease processes. Mesotheliomas and metastatic tumors may be identified. Idiopathic pericardial effusions often are linked to inflammatory or immune processes. In these idiopathic cases, the effusion is sterile, and often hemorrhagic. Thickening of the epicardium and pericardium may be seen during histologic examination, along with associated inflammation. Infectious processes occur least commonly, but can include fungal disease, such as coccidiomycosis, and, rarely, bacterial pericarditis. Pericardial effusion is commonly seen in golden retrievers and other medium to large breed dogs. Any age dog can be affected, although one study noted the median age of dogs with idiopathic pericardial effusion was 7 years, while in dogs with nonidiopathic effusions, the median age was 9 years.4 This same study found a higher prevalence of pericardial effusions in male dogs. Patients experiencing chronic pericardial effusion may demonstrate weakness, abdominal enlargement, cough, tachypnea, and episodes of syncope. In those with acute pericardial effusion, acute episodes of collapse and weakness may be evident.2 As pericardial fluid accumulates, shock and death can occur. While it is important to understand which types of pericardial effusion are more likely to be seen with certain conditions, cytology of pericardial effusions is rarely able to differentiate between neoplastic and idiopathic causes. 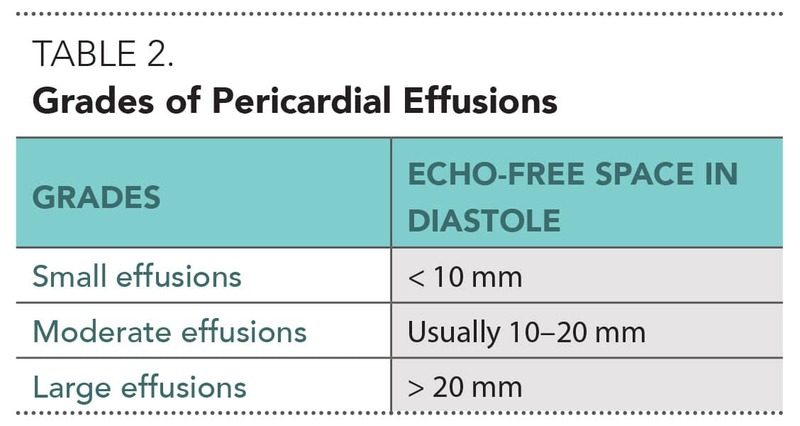 The etiology of pericardial effusions is most commonly determined by echocardiography (see Management). Hemorrhagic effusions are common in dogs, while transudates are moderately frequent in dogs and cats. Exudative effusions are fairly rare in small animals. Protein concentration > 3 g/dL. Hemorrhagic pericardial effusions in canine patients are commonly caused by hemangiosarcoma. Heart base tumors, pericardial mesotheliomas, malignant histiocytosis, lymphoma, and metastatic carcinomas may also cause hemorrhagic pericardial effusion. Pure transudative fluids are typically clear, with a specific gravity < 1.012 and protein concentration < 2.5 g/dL. In contrast, modified transudates often appear slightly cloudy or have a pink tinge, with a specific gravity of 1.015 to 1.030 and protein concentration of 2.5 to 5 g/dL. Although less sensitive than echocardiography, radiography can be a useful start for primary care facilities. The overall cardiac silhouette appears enlarged, and excessive amounts of fluid can cause a globoid-shaped heart on both the ventrodorsal and lateral views (Figure 2). Advanced imaging, such as magnetic resonance imaging, is now being used more often to diagnose the presence of cardiac masses in patients with pericardial effusion. FIGURE 2. Lateral thoracic radiograph of an enlarged and globoid-shaped heart due to an excessive amount of fluid accumulation in the pericardium. Echocardiography is the most frequently used test for detection of pericardial effusion and diagnosis of pericardial masses. Pericardial Effusion. 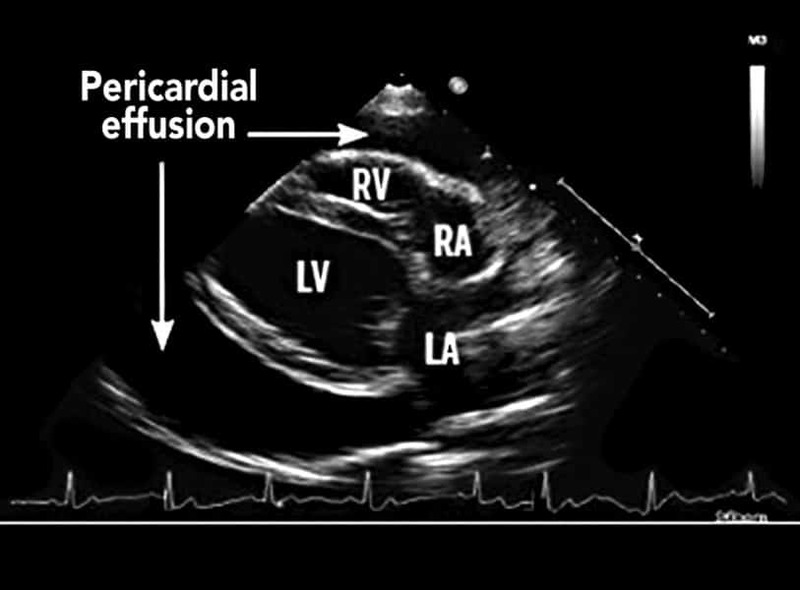 Smaller effusions are first seen over the posterobasal part of the left ventricle.5 The effusion appears as a sonolucent, echo-free void between the parietal pericardium and the epicardium (Figure 3). 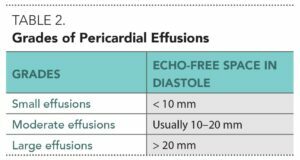 In patients with large quantities of fluid, the heart may appear to be swinging back and forth during echocardiography.3 When the effusion has increased and is circumferential, it may be graded as small, moderate, or large (Table 2). Cardiac Tamponade. When cardiac tamponade occurs, diastolic collapse of the right atrium and, sometimes, the right ventricle may be seen during the echocardiogram. The heart may also “swing,” because it floats within the pericardial space in a phasic fashion. In these patients, right atrial collapse may last longer during the systolic phase. Lastly, hepatic vein distension and ascites can help support the presence of cardiac tamponade as well. Electrocardiography (ECG) can also be a useful diagnostic tool, especially when determining the presence of cardiac tamponade. Electrical alternans occurs when the size or configuration of the QRS complex, and occasionally the T wave, changes beat-to-beat. This ECG finding may suggest a large volume of pericardial effusion, and results from the heart moving back and forth within the pericardium (Figure 4). FIGURE 4. Electrocardiogram demonstrating electrical alternans, in which the height of the QRS complex alternates with each beat due to the heart swinging within the pericardium. This finding is rate dependent and more commonly seen at a normal heart rate. Watches the ECG to monitor for any arrhythmias while the procedure is being performed; a critical component to the process. When pericardial effusion recurs after one or more pericardiocentesis procedures, pericardiectomy can be considered. Excision of the right auricular appendage when a mass is isolated to that area of the heart. Thoracoscopic pericardiectomy is an alternative method, with a lower morbidity rate than traditional thoracotomies. However, the inability to visualize the right atrium as a whole is a disadvantage of this technique. 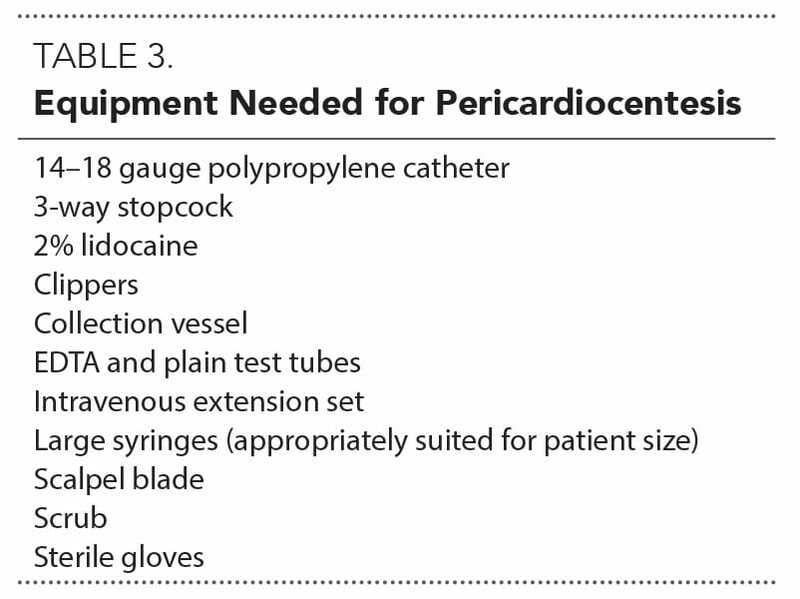 A minimally invasive option is available: the application of percutaneous balloon pericardiotomy in which a balloon catheter is inserted percutaneously into the pericardial sac and inflated until it tears the pericardium, resulting in drainage of pericardial fluid into the pleural cavity. This procedure was reported to be successful in 4 out of 6 canine patients with recurrent pericardial effusion,8 and may be considered in patients with a poor long-term prognosis as a result of neoplasia. 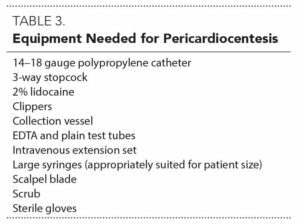 The ability to recognize potential history and clinical signs consistent with pericardial effusion can greatly improve the technician’s triage skills. 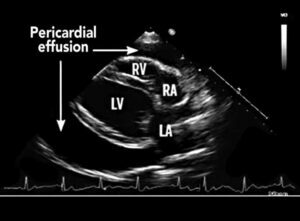 Rapid detection of clinical signs of pericardial effusion, along with swift implementation of treatment, can lead to a more successful outcome for the patient. Jutkowitz LA. Managing pericardial effusion in the dog. Kansas City, MO: CVC Proceedings, 2008. Shaw SP, Rush JE. Canine pericardial effusion: Diagnosis, treatment, and prognosis. Compend Cont Ed Pract Vet 2007; 29(7):405-411. Ware WA. Pericardial diseases and cardiac tumors. Cardiovascular Disease in Small Animal Medicine, 2nd ed. London: CRC Press/Manson Publishing, 2007, pp 320-328. Mellanby RJ, Herrtage ME. Long-term survival of 23 dogs with pericardial effusions. Vet Rec 2005; 156:568-571. Nelson RW, Couto CG. Pericardial disease and cardiac tumors. Small Animal Internal Medicine, 5th ed. St Louis: Mosby, 2013, pp 161-168. Olcott M, Sleeper M. Recognizing and treating pericardial disease. Vet Med 2010; 105:218-218. Slatter D. Interventional catheterization procedures. Textbook of Small Animal Surgery, 3rd ed. Philadelphia: Saunders, 2003, p 928. Sidley JA, Atkins CE, Keene BW, DeFrancesco TC. Percutaneous balloon pericardiotomy as a treatment for recurrent pericardial effusion in 6 dogs. J Vet Intern Med 2002; 16(5):541-546. Mann D, Zipes DP, Libby P, Bonow RO. Diseases of the heart, pericardium, and pulmonary vasculature bed. Braunwald’s Heart Disease: A Textbook of Cardiovascular Medicine, 10th ed. Philadelphia: Saunders, 2014, pp 1640-1646. 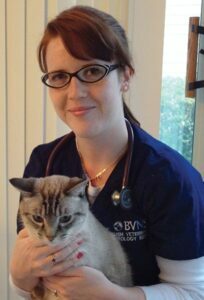 Oriana D. Scislowicz, BS, LVT, is Team Leader of CVCA – Cardiac Care for Pets, Richmond, Virginia. She currently serves on the editorial advisory board of Firstline, and has served on the executive board of the Virginia Association of Licensed Veterinary Technicians. Ms. Scislowicz writes for publications, such as NAVTA Journal, Firstline, VetTechLife, and Today’s Veterinary Practice. She received her BS in psychology from Virginia Commonwealth University and her AAS in veterinary technology from Blue Ridge Community College.